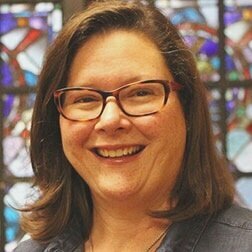 Terry Hamilton-Poore comes to us from First Presbyterian Church in Neenah, WI, where she has been serving as the interim Head of Staff for the past two years. Born in Chicago, she moved with her family to Greensboro, NC when she was 10. Terry earned her Master of Divinity (with emphasis on Preaching and Christian Ethics) from Duke Divinity School, where she was also the recipient of the Senior Preaching Award. She is currently enrolled in the Doctor of Ministry Program, with an emphasis on Congregational Revitalization, at McCormick Theological Seminary in Chicago, IL, where she has also completed the seminary’s Certificate Program in Executive Leadership. Terry is married to Sam Hamilton-Poore, a native South Carolinian who graduated from the University of South Carolina, and, like Terry, attended Duke Divinity School (where they met). They have three grown children. A Louisiana native, Cat is a graduate of Austin College in Sherman, Texas and Boston University School of Theology. Cat's passion for service and justice grew out of experiences serving the church on the US-Mexico border during college and a year as a PC(USA) Young Adult Volunteer in Guatemala. After seminary, Cat was a community organizer and directed the Community Engagement Program for Chelsea Neighborhood Developers, a nonprofit community development corporation. Having discerned a call to parish ministry, she and her husband, Dary, moved to Atlanta, where she served three years as a Resident Pastor at Central Presbyterian Church, through the Lilly Foundation's Transition into Ministry program. Cat and Dary love the outdoors, local food, and their daughters, Madeline and Gillian. Patti was born and raised in the state of Alabama and her heart bleeds blue and orange for Auburn. She retired as Christian Education Director at Southminster Presbyterian Church after many years in the summer of 2012 and came to FPC as the part time Director of Christian Education. Patti is married to Tom Winter, a Presbyterian minister, and mom to Mark (a teacher) and Rachel (a Presbyterian minister). Emily has been a member of First Presbyterian for the past 10 years. When her family joined FPC, she became a member of this very youth group! She is a graduate student at UAB, studying School Counseling. After graduating with a Bachelors degree from Troy, Emily worked for 1 year with youth who have emotional disorders, and she has spent the last year and a half working at Mitchell’s Place with children who have autism. Now, Emily is just starting a year long AmeriCorps service position with the Birmingham Education Foundation. During school hours, She’ll be working in Birmingham City Schools with middle and high school students teaching college and career readiness skills. Emily loves working with young people, and she is so excited for the opportunity to work with the youth of our church! Hye-Sook Jung was born and grew up in Seoul, South Korea. She had grown up in a strict Presbyterian family in Korea. Her father was an elder for many years at their church and she began to serve as a church pianist and organist when she was in 5th grade. In 1999 she moved to the USA with her husband to pursue their advanced degrees. Hye-Sook is currently the Instrumental Director at Indian Springs School where she teaches private piano lessons, AP Music Theory, Music Ensembles and accompanies the choir. She has previously served as an Assistant Professor of Music at Stillman College in Tuscaloosa, Alabama for nine years, and an organist/pianist at Northport United Methodist Church for fourteen years. She received her Bachelor of Music degree of Piano Performance at HanYang University, and her Master of Music Degree of Piano Accompanying from Sungshin University in South Korea. Hye-Sook completed her Doctoral Degree from The University of Alabama where she was a student of the late Amanda Penick. During her entire study at the University of Alabama, she was a recipient of the Narramore Music Scholar Award, which is the most prestigious fellowship at the School of Music. She is very happy to be a part of the First Presbyterian church. Kandi says that only her grandmother could have gotten the nickname Kandi out of Lytressa Carter Wiley. Kandi was born an "army brat" in Fort Knox, Kentucky. She grew up here in Birmingham where she finished high school, attended UAB, and graduated from the Herzing Institute. Kandi later moved to Anchorage, Alaska. After a three year stint in Florida, she came home to Alabama. Kandi has been at First Presbyterian Church for many years, where she sings and whistles and keeps the staff laughing. When she is not here, she enjoys spending time with her family, reading, baking, and fishing. A native of Alabama, Laura keeps FPC on schedule and on task. I was born and raised in Birmingham and some might say I am an obnoxious ALABAMA fan! My husband and I just celebrated our 21st anniversary. We have a beautiful daughter that will soon be headed off to college . After sixteen years of being a stay at home Mama, I knew I would be facing a forced retirement, so I decided to join the working world! I am a member of St Stephen's Episcopal Church. I'm also on the Jr Board of Visitors of the UAB School of Nursing.